for the attention of Rabbi Levitanski and his Rabbinical council. This report is accompanied by photographs and video documentation of the Kapparot 1996. I have included literature to assist in an in-depth understanding of why the chickens that you used were in poor health and present serious questions as to whether such chickens could be considered kosher on any day of the year, much less a sacred Jewish holiday. This report is designed to open up discussions and may easily be supported by more descriptions and visual documents upon request. My intense involvement in the past year with the chickens changed me and many people who met them. 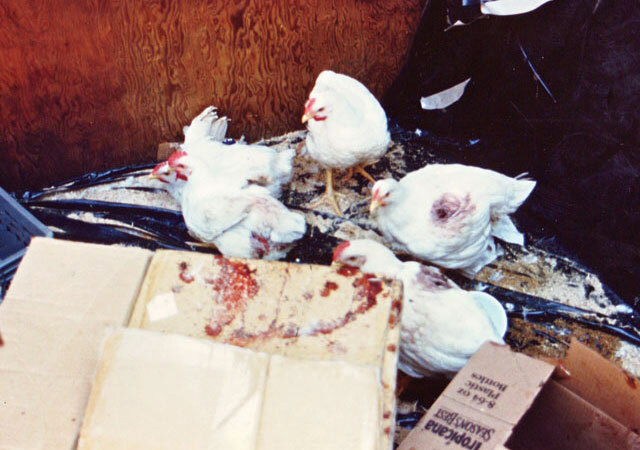 Most of us had no idea how extensively damaged the chickens as a species have become as a result of human manipulation. Please understand that although the following is not easy to read, even ugly to think about, the intention is to constructively use this information to improve the situation. I write to foster understanding of who the chickens are and to explore our moral responsibility to them. I was living in Santa Monica, California, across the street from Rabbi Levitanski on the night of the slaughter called Kapparot. On the morning of Friday, September 19, 1996 I entered the Kapparot shed with the Rabbi's son. Inside were approximately 200 large chicks about 7 weeks old. Their youth is evident from the video that I shot where you can clearly see their small combs and waddles and hear their chirping baby voices. Their white feathers had urine and feces covering them so that they were a dark yellow-brown. They had obviously lived in filth for a long period of time. Filth had crystallized on their feathers into hard stones along their undersides. When I found them, they were wet from lying on the plastic covering of the concrete floor that was covered with urine, feces, and blood. Of the five holding pens, only two had containers of drinking water - and those were brown, full of excretions. I immediately asked that they receive fresh water in all of the enclosures. The children present were happy to fetch bottles of clean water for them. I brought over a bag of scratch grain and distributed it to the birds. 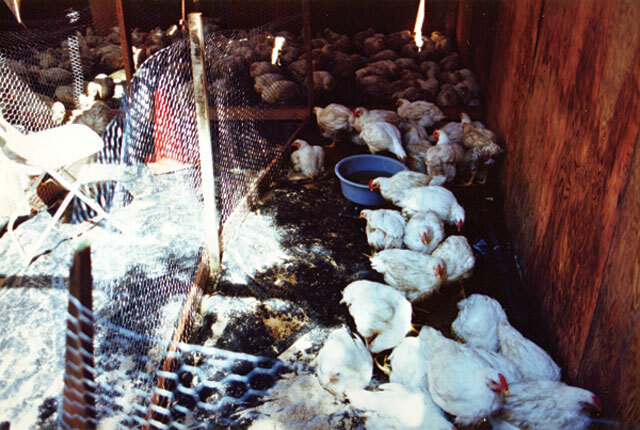 Dozens of the chickens were unable to stand or walk to get to the water or food. These birds remained sitting motionless or trembling from their cold damp feathers and physical pain. Others were frustrated at not having the strength to stand and walk. Many had deep wounds cut into their flesh. Chickens sometimes bite each other due to the stress and shock of having been deprived of food and water. The sight of these chickens bleeding in filth sickened both the Rabbi's children and myself. We saw that the birds were dying and in desperate states of neglect. "There are probably no creatures that require more the protective Divine word against the presumption of man than the animals, which like man have sensations and instincts, but whose body and powers are nevertheless subservient to man. In relation to them man so easily forgets that injured animal muscle twitches just like human muscle, that the maltreated nerves of an animal sicken like human nerves, that the animal being is just as sensitive to cuts, blows, and beatings as man. Thus man becomes the torturer of the animal soul, which has been subjected to him only for the fulfillment of humane and wise purposes." I grew up with Jewish friends in Beverly Hills. I could not imagine how this cruelty could be tolerated by any of the Jewish people that I know. I insisted on meeting with Rabbi Levitanski about the pain and suffering of these chicks. I was told that an effort was being made to contact the Rabbi for me. I asked for permission to remove the dead birds from the area so that the living birds didn't have to smell their decaying bodies. My wish was granted. I filled four large boxes with corpses of sadly swollen purple bodies that were sprawled across the floor and in a pile in the corner where they were covered by live birds who clung to them. I had to bring a friend to lift two of the boxes because they were too heavy for me to pick up. My friend almost threw up from the smell and sight of the gruesome corpses and he did not want to touch the box. I pleaded for him to take the boxes to the dumpsites for the sake of the living birds and to throw the dead away. The bird on the bottom of the pile I took home and buried. Word came back from the Rabbi that the rest of the chickens would not be slaughtered at the house out of respect for the feelings of my pet chickens who lived across the street. He would not be able to meet with me soon and was uncertain whether any more chickens would be needed for Kapparot this year. They were expected to return to the "farm." I asked if they would consider letting the remaining birds live out their lives in peace at a ranch in Malibu. His response was that another slaughter was to take place and he did not know if there would be any chickens left. I persisted with my concern about the suffering of the existing chickens. I asked if it would be possible for me to have the chickens who were obviously dying. I pointed to several large bloated featherless purple bodies with wet backs and shallow breathing. I was told that as long as they were breathing they had to be used for sacrifice. Yet they were almost dead. To die there or on the sunny grass in my yard made little difference in some ways, but the thought of someone eating these animals, as food, scared me to my bones. The next day when I returned to assist in the care of the birds, every one of purple swollen bodies had died exactly where I last saw them. righteousness like an ever flowing stream." There I stood with the Rabbi's son as both of us faced a strange need for change in this predicament of a "straight-jacket" hold of an old family custom. He told me that he himself was a vegetarian and quite aware of the damage that poultry production has done to the environment and human health as well as factory farming's violations of the natural behavioral patterns of farm animals. But, he said he felt there was nothing he could do because this project belonged to his family. There was a pause of silence as we observed the starving birds return to eating one another. The bag I brought could not feed all of these birds. Some chickens pathetically tried to refresh themselves with a "dust bath" of manure mud on the plastic liner. Proverbs 12:10 states that "the righteous person regards the soul of his or her beast." Psalm 145:9 states that "The lord is good to all, and His tender mercies are over all His creatures." There had to be a way for at least a little mercy to happen on this day for some of these poor creatures. The Rabbi's son felt certain that Jewish law states that in order for an animal to be rated Kosher, the animal could not have an open bleeding cut. He said that because of this law, he knew his Father would not be able to use any of the birds who had the open bloody sores. He offered boxes for me to take the bleeding birds as long as I stopped at sun down, which was soon. By Saturday two more birds had died and I spent the morning nursing the wounds and stabilizing the flock. I took four birds with severely damaged wings to my veterinarian, Dr. Spira. All four had to be put to sleep for broken - swollen bones and protruding bones causing chronic pain that would never heal (see doctor's report). It was later in the afternoon when I returned to Rabbi Levitansky's' house after tending to the chickens. I was greeted by his family, as the Rabbi was out. I gathered the newly dead birds and carried the boxes to the dumpsite. I cleaned their water and brought more scratch. In desperation for food, many birds were eating parts of other living birds. Again I was allowed to carry the birds with bloody sores home as long as I stopped by sundown. Again this meant that several remained there to bleed and be eaten alive. Sundown quickly came and my time was up. I said good-bye to the birds that remained never to see them again. Mrs. Levitansky and her family were dressed up for the synagogue and we wished each other a good evening. She is a very warm-hearted woman and I was always happy to be her friend and neighbor. She seemed distressed about the situation in her front yard and she thanked me for taking care of these birds. Later, she she told me that she thought "something was wrong with the birds when they arrived." She said, "I always thought that chickens are supposed to be lively and run around, but these birds could hardly stand. They were sad and sorry to look at." Yet it seemed that the family members felt powerless to stand up to the rest of the family and speak their mind. For that reason, they were almost glad that I came forward and took a stand on behalf of the chickens. I felt that in their hearts, they wished they would have done more for these birds. Although I am a non-Jew, I present the following quotes and questions to you with the understanding that the creator that gave life to me and my parents is the same creator that created you and yours. A Rabbis' relationship with our creator directly influences hundreds, thousands, even millions of people in his lifetime, affecting their fulfillment of G-D's' work and expression here on Earth. I pray I have found the proper Torah Talmudic passages and other text so that we can have a meeting of minds. I asked the author, Dr. Richard H. Schwartz, if there is an alternative to Kapparot that could be substituted at the Chabad on 17th Street in S. Monica for their 1997 Yom Kippur and Rosh Hashanah? Dr. Schwartz explained that Kapparot is not biblically or talmudically ordained. (as it is not tsa'ar ba'alei chayim). Rather the custom arose at a later period in Jewish history. Many Jewish sages have condemned kapparot. They emphasized that repentance and charity can be more meaningfully conducted by substituting money for a bird. Consistent with Rosh Hashanah as a time when Jews "awaken from slumber and mend our ways," using money for the Kapparot ritual shows that we are putting the Torah teachings into practice. Acts of kindness and charity are consistent with G-d's "delighting in life" on Rosh Hashanah, and, unlike the kapparot ceremony, does not involve the suffering and death of animals. Please consider that Hashem's covenants with animals is just as with humans. Genesis 9:1-10, Hashem says "As for me," says the lord, "behold I establish My covenant with you and with your seed after you, and with every living creature that is with you, the fowl, the cattle, and with every beast of the Earth with you; all that go out of the ark, even every beast of the Earth." question # 4. How are farm animals treated today? As we have seen, the Jewish tradition stresses compassion for animals and commands that we strive to avoid causing them pain (tsa' ar ba' alei chayim). Unfortunately, the conditions under which animals are raised for food today are quite different from any laws the Torah would endorse. Chickens are raised for slaughter in long, windowless, crowded sheds, where they never see sunlight, breath fresh air, or get any exercise. From hoppers suspended from the roof, they obtain food and water, along with many chemical additives according to a programmed schedule. Crowding is so bad that chickens cannot even stretch their wings. The results of these very unnatural conditions are potential feather pecking and cannibalism. 5. Summarize the Inconsistencies Between How Animals are raised today and Jewish Values? Jews who continue to eat meat raised under such conditions help to support a system which is contrary to basic Jewish principles and obligations. 6. Don't the laws of shechita provide for a humane slaughterer of animals so we need not be concerned with the violations of Tsa'ar ba'alei chayim? It is true that shechita has been found in scientific tests conducted in the United States and other Countries to be a relatively painless method of slaughter. But can we consider only the final minutes of an animal's life? What about the tremendous pain and cruelty involved in the entire process of raising and transporting animals? When the consumption of meat is not necessary and is even harmful to people's health can any method of slaughter be humane? Is this not a contradiction in terms? 17. Aren't animals raised for the kosher food market treated more compassionately than other food animals? Unfortunately, animals raised for the kosher food market are raised under the same conditions as non-kosher animals. It is only the process of slaughter that differs. For these reasons the gift of money is a better symbol to be used for a ceremony whose purpose, according to Rabbi Levitansky is to "awaken in a person the urge to do correct repentance." Judging from the statements of Maimonidnes, R. Judah ha-Shid, Rabbi Samson Raphael Hirsch and Rabbi Kook, if they were alive today they would certainly be against the practice of kapparot. Isiah 1:11 "What to me is the multitude of your sacrifices? Sayeth the Lord; I have had enough burnt offerings of rams and the fat of fed beasts. I do not delight in the blood of bull, or of lambs, or of he-goats." Mediterranean Jews use another ceremony called Parpisa in their celebration of Hashem's creation of the world. Parpise is done with a basket for every child in the household which is filled with earth and loam; then planted in the baskets are seeds wheat, barley, or various kinds of beans a few weeks before Rosh Hashanah (weaving the basket by hand is optional). The seeds grow a few handbreadths high. Each child takes a basket and swings the basket around his or her head seven times and recites: "This instead of me, this is my proxy, this is my substitute"--and casts it into the river. Months passed as I waited for my meeting with Rabbi Levitansky. In the mean-time I tended to the healing of the chickens, and watched them die as many were beyond hope. All along I was rewarded with the tender delights of seeing these babies learn to live and enjoy sunshine and fresh food for the first time and in knowing that the ones who died got to do so with dignity. Each one had a distinct personality and moved at their own pace. A few that were paralyzed received medical care and holistic therapies and learned to walk and run! What had I gotten myself into, I wondered. I had four chickens already, (Hillary, Winter, Cupid and Bonnie Lad) who had frequently played with the Rabbi's children. They even appeared together once in the Santa Monica Outlook Newspaper (volume 2, No. 17 April 19 - May 16, 1996 p..31). Ironically Hillary Chicken had even starred in a children's play at the shul about kindness to animals. Since at this time I knew nothing about this type of chicken, I contacted Karen Davis, Ph.D., President of United Poultry Concerns and author of several books that pertain to the modern poultry industry. I explained my situation and the terrible condition of the birds. Although I intended to take them to a ranch in Malibu, they would need to be stabilized and somewhat healthy before I could leave them anywhere. Karen spent hours on the telephone with me helping me to understand why these birds seemed to be "deformed." "Chickens and turkeys are foraging birds unsuited to the life we impose on them in order to satisfy human wants in the modern world. An example is the forced rapid growth of their bodies for meat production, causing them to incur severe skeletal and metabolic pathologies. Yet, a major thrust of genetic engineering is to increase their abnormal growth rate even more for the meat industry," Karen Davis, Ph.D. The Ethics of Genetic Engineering and the Futuristic Fate of Domestic Fowl. To my surprise, the crippled birds who struggled to perform many basic bodily functions, such as breathing, walking, being able to see, etc., were only the status quo of modern "broiler chickens" of which mine were typical examples. Karen Davis' advice to me first off was to let the chickens spread out in my yard, give them at least a week or two to relax, make a variety of foods available to them including plenty of fresh green leafy plants, and plenty of water. I daily cleaned their wounds with hydrogen peroxide and antibiotic ointment Their water was kept clean and had vitamins mixes in. Dr. Spira prescribed antibiotics to chickens with Marek's disease, e-coli bacteria and other pathogens diagnosed from blood laboratory tests. Injections of B vitamins were administered to repair the nerve damage of several others. Even with doctor's care they continued to die until I had sixteen left from thirty in two weeks. Seven roosters and two hens went to the Malibu Ranch and the seven others were too sick and needed special care. As the chickens that stayed at my house died, I brought back the two hens and three of the roosters from Malibu. For a week Dusty showed her spirit and courage even while the thickness developed in her chest. It seemed that her lungs filled up with fluid, even so, she died with some dignity in a loving place. Napoleon had no feeling in her feet and could not stand or walk and after a month of consistent care walked and then ran. I was overwhelmed with excitement when she took a large piece of dried bread away from my three leghorn roosters dashing here and there until she got it into the house where she devoured it. Dr. Spira said that "her recovery was a miracle." A hen named Harlow was unable to walk and dragged her body as she flapped her wings, also learned to walk and have quite a personality. Oscar had no feathers and severe orthopedic problems and became a handsome young rooster with enough feathers to cover most of his body and a strong spirit to hang in with the flock regardless of his swollen joints and restricted neck and leg movements. Julie had a bone of her wing exposed, and as it healed she slowly regained her self-confidence. She was truly a love bird with the sweetest, most amiable nature. She died from being overweight with intestinal and digestive obstructions. Olivia was a quiet but affectionate hen who would always like to sit with me when-ever possible. When she died, she slowly turned purple over a period of two weeks until one day, she suddenly lunged at my feet and died from an apparent heart attack. Eric and Flash were best friend roosters who died about a month apart from intestinal and crop congestive complications and bumble foot. Bernard was a very gentle spirit who always did what I wanted him to do and I exhibited him at several public events because he was always so well behaved, one day recently I found him laying dead on the ground like he just fell asleep, it seemed to be from obesity. Henry and Natasha are the sole survivors of last years Kapparot, every day I know it may be their last, and every day I thank the creator for all that I experienced while being with these chickens. These rescued birds became part of my flock family. In time I got to know them individually and I developed a love for them. Their ability to express themselves and to return loving gestures when treated with kindness came through in a Universal language. I have no doubt that each bird has a soul and a connection in spirit to the same creator of my own flesh and blood, as well as yours. In spirit each of these unique creatures live on in my heart and inspire me to strive for the same strength that they exhibited so clearly in their lives. Their enrichment of my life has been a gift to me from G-d. Do you agree with me that G-d included chickens when he spoke in the following passage. Genesis 1: 20-23 G-d said, "let the waters bring forth swarms of living creatures, and birds that fly above the Earth across the expanse of sky." And G-d created the great sea creatures, and all the living creatures of every kind that creep, which the waters brought forth in swarms, and all the winged birds of every kind. And G-d saw that this was good. G-d blessed them, saying, "Be fertile and increase, fill the waters in the sea, and let the birds increase on the Earth." And there was evening and there was morning, a fifth day." One hen, Esther Morgan was flown to Maryland and lived with Karen Davis for several months until she died. When the Doctor opened her up for examination he found several eggs with their shells compacted in her stomach. Esther Morgan was a very lovable hen who loved to perch in high places and liked to be to herself much of the time. I was happy that she was able to enjoy her life at United Poultry Concerns for as long as she did. Karen Davis was very fond of her, as was I, and we will always cherish her memory. Karen Davis, Ph D., who adopted Esther Morgan and taught me to understand the rest of the birds that came into my life literally overnight, is an expert in the studies of chickens. You can also familiarize yourself with the truth of innate sickness and diseases of broiler chickens by reading chapter 4 of her book Prisoned Chickens Poisoned Eggs. I thought you would also be interested in reading a summary of a paper that Karen Davis presented at the Ethics of Genetic Engineering and Animal Patents Conference, at the University of Wisconsin, October 12, 1996 (see attached). Having taken into her home one of your hens, I am sure that she would be happy to answer any of your questions. Karen Davis' telephone number is 757-678-7875, or e-mail: karen@upc-online.org. I have much more that I can say and show in videos and photographs concerning these beautiful creations of G-d. I am ready and willing to talk for these animals at your earliest convenience. I also look forward to a continued friendship with the Levitansky family in the years to come. They are beautiful people and I appreciate their willingness and availability to research and discuss Kapparot and alternatives to Kapparot with me in the near future, and for allowing me to visit the chickens last year to participate in a rescue that has changed my life and my feelings of respect for chickens forever. I pray that this information will foster discussion and lead as Rabbi Levitansky suggested to a Beth Din.